As a young adult, Dorothy Day began an acquaintance with jail cells that she would keep up well into her old age. In 1917, barely 20 years old and an ardent socialist, she was arrested while protesting for women’s suffrage in front of the White House. Throughout the late 1950s, she was apprehended in New York City every summer for refusing to participate in air raid drills that were supposed to prepare the populace to survive a nuclear attack. Somewhere in between that early arrest and the later ones she underwent a dramatic conversion, abandoning her politics and bohemian lifestyle for a deep commitment to the Catholic faith and the movement known as Catholic Action. Taking up the biblical injunction to feed the hungry and tend the sick, Day and an informal band of followers who called themselves the Catholic Workers opened “houses of hospitality,” first in New York City and then around the country, to serve the poor, the homeless, the addicted, the unemployed, and anyone else in need. Catholic Workers lived among the people they helped, as if members of one family. Such work required an unqualified commitment, but Day continued to inspire individuals, young and old, to make it until her death in 1980 and even afterward. According to the tenets of Catholic Action, the Church was not only a religious institution concerned with the otherworldly salvation of individual souls; it was also a this-worldly organization whose members had a responsibility to apply its teachings in the social, economic, and political spheres of life. That duty fell to lay people no less than to bishops, priests, and sisters. The laity would be guided by the hierarchy, to be sure, but the Church’s work had to be theirs, too. Catholic Action in America was built on the organizational efforts of earlier devotional groups—such as the Holy Name Society, Knights of Columbus, and St. Vincent De Paul Society (for men) and parish rosary sodalities and altar societies (for women). These groups had emphasized prayer and the spiritual benefits of serving others, while forming a bulwark against the attractions of secular social clubs. But Catholic Action stood apart from them in several important respects. Whereas devotional societies promoted the religious welfare of the individual member, the benefits that Catholic Action groups sought were societal as much as they were personal. Charitable work in the local parish and neighborhood was fine, but some problems were too big to be addressed only at the parochial level. Catholic Action groups drew on the deep American urge for reform—just as many Protestant churches had done in pursuing what they called the Social Gospel. Members were expected to pray, but prayer had to be accompanied by sustained work in the world. The Catholics who came together under the figurative banner of Catholic Action would ultimately define a new era for their Church and begin to shift the traditional balance of power and influence between lay people and the clergy. The poor will always be with us, as Jesus noted, but by the early 20th century, Americans had widely come to recognize the need to address the problems of poverty systematically. Child welfare, crime, the harsh conditions of industrial labor, and other issues posed formidable challenges. Political Progressives and Protestant Social Gospelers were calling for structural reform, and Catholics began to speak this language, too. “We are determined,” a priest from Cleveland told a lay gathering in 1909, “to approach these problems not only in an individual way, but by organization.” Catholics, he noted, had special reasons to work for fundamental change. After all, some social problems hit them hardest and first. Many Catholics lived in the older, decaying city neighborhoods most in need of revitalization. They toiled in unsafe factories and their children often left school to help support the family. There was also some fear that political and social radicals might capture the reform agenda and woo Catholics away from the Church. The anarchist Industrial Workers of the World (known as the IWW, or “Wobblies”) did make headway among the largely Catholic textile laborers of Lawrence, Massachusetts, in the “Bread and Roses” strike of 1912. The case of Nicola Sacco and Bartolomeo Vanzetti, a cause célèbre in the 1920s, raised another warning flag. The two Italian radicals ought to have been Catholics, Church leaders believed. “There is a very real danger,” one priest wrote, “that large masses of our workingmen will, before many years have gone by . . . look upon the Church as indifferent to human rights and careful only about the rights of property.” A Church-sanctioned reform program would demonstrate that working for change did not require abandoning one’s faith. If Catholics were numerous in the ranks of the lower classes, it was social and economic progress elsewhere within the Catholic community that made the Catholic Action movement possible. With immigration largely choked off, the Catholic population held steady at roughly 16 percent of the nation between the two world wars (it now accounts for 24 percent), and Catholics were beginning to take their place in the middle class. Education, particularly higher education, was crucial to this process. By the 1930s, there were approximately 70 Catholic colleges and universities in the United States, preparing graduates for careers that would have been unthinkable for their immigrant parents. At the beginning of the century, less than 5 percent of the graduates of the all-male College of the Holy Cross in Worcester, Massachusetts, run by the Jesuit order, wound up in management positions; most became priests or teachers. By the 1940s, nearly 30 percent were going into business, and another 25 percent were going into law or medicine. It was the same with the men who graduated from the Jesuits’ Loyola College in Baltimore. Among 2,200 living alumni surveyed in 1952, there were 180 doctors, 115 accountants, 80 engineers, and almost 900 businessmen representing enterprises large and small. Graduates of women’s colleges made occupational progress more slowly, in part because of differing societal expectations about women and work. The president of Manhattanville College, run by Religious of the Sacred Heart, observed in 1942 that most of her school’s alumnae were marrying shortly after graduation, but that “a second group, smaller by far but keen, ambitious, and with wide outlook,” were pursuing careers as doctors, lawyers, and teachers. These “keen” Catholic professionals, with their “wide outlook,” were ready to tackle social problems. The First World War marked a turning point, presenting both need and opportunities for coordinated efforts by Catholics. The Knights of Columbus, for instance, who had long ministered to Catholics in the armed services, offered refreshment and entertainment to American troops in Europe. “Everyone Welcome, Everything Free,” the K of C banners proclaimed. The country’s bishops formed the National Catholic War Council “to unify the energies of the whole Catholic body and direct them toward the American purpose.” When peace returned, the council was renamed the National Catholic Welfare Conference (NCWC) and its headquarters moved from New York City to the nation’s capital. Two NCWC departments, those devoted to social action and lay activities, proved especially energetic. Led by John A. Ryan, a priest from Minnesota who taught economics and moral theology at Catholic University in Washington, the social action department put forward a detailed plan for “social reconstruction,” which the bishops endorsed as their own. The plan supported workers’ right to a living wage, social security insurance, restrictions on child labor, and expanded government programs of affordable housing. The spark behind the NCWC’s lay department was Agnes Regan, a retired schoolteacher from California, whom the bishops appointed in 1920 to oversee formation of the National Council of Catholic Women. (Ratification of the Nineteenth Amendment had given women the right to vote the year before and may have suggested a more active role for women.) Within two years, more than a thousand local groups became affiliated with the new women’s council. Under Regan’s guidance, it focused much of its effort on promoting women in social work. It ran an employment agency for social workers and started a school of social service, which became affiliated with Catholic University. Regan also monitored state and federal legislation and was an active lobbyist for the restriction of child labor. Organizations established by the Church’s hierarchy did much to foster cooperation among Catholic lay associations, but groups formed by lay people themselves were more significant signs of the emerging spirit of Catholic Action. The Catholic Workers were the most widely recognized example of the new lay initiative. Dorothy Day had lived an eventful life before startling her friends in 1927 by becoming a Catholic. A few years later, she and Peter Maurin, a French émigré and mystical self-declared philosopher, began publishing a monthly newspaper, the Catholic Worker. They chose the title, a play on the Communist Party’s Daily Worker, deliberately. The houses of hospitality they started combined the features of traditional settlement houses with those of religious communes. Residents maintained an active life of prayer and reflection, guided by Maurin’s approach to the philosophy of Christian “personalism.” Maurin outlined a plan of self-examination and discussion known as the “clarification of thought,” a process intended to be more or less continual among Catholic Workers. Under his influence, the movement also opened farming communities, grandly titled “agronomic universities,” first on Staten Island, New York, then upstate, then elsewhere. These yielded produce for Worker soup kitchens, but they were also attempts to re-create the traditional monastic ideal that fused prayer and manual labor. Though Catholic Worker membership was never very large and always somewhat fluid, the movement’s impact was considerable. The newspaper had a nationwide circulation of more than 100,000. Most readers would never visit a house of hospitality themselves, but they were inspired by the intense personal commitment the Workers were making. Many among the clergy were cautious at first, troubled by the radical tone and, during the Second World War, by Day’s insistent and absolute pacifism. New York’s powerful Cardinal Francis Spellman had a run-in with Day in 1949, when she picketed his residence on behalf of the gravediggers in Catholic cemeteries who were trying to form a union. (Yet again, Day was arrested.) Catholic prelates were not accustomed to being picketed by their own people. But Day’s example was hard to ignore—a “literal interpretation of the gospels,” as one supporter put it. Most important, the Catholic Workers were lay people. Priests occasionally visited for Mass, prayer, and their own “clarification of thought,” but the houses of hospitality were always run by and for lay Catholics—the new model of lay action. Maurin’s agronomic universities were never the success he hoped them to be, but other Catholic groups were also giving attention to Americans living on the land. In 1923, a priest from Granger, Iowa, began the National Catholic Rural Life Conference (NCRLC), with the support of an assembly of priests, bishops, and lay people. A growing sense that rural Catholics were being overlooked by the Church, combined with the decline of the family farm, soil exhaustion, and uncertain markets for crops during the Depression years of the 1930s, spurred the organization’s growth. Some conference statements sounded considerably more radical than those usually coming from Church sources. “The industrialization of agriculture,” an early handbook thundered, “permits machines to plow under the farm families . . . the very culture on which America has grown to greatness. This reckless destruction which our system of unbridled free enterprise has made possible must be stopped.” In their widely scattered parishes, Catholic farmers organized to establish cooperatives and credit unions. “Cooperation is merely the free operation of the Golden Rule in our economy,” read one NCRLC brochure, calling the effort a religious alternative to “unbridled free enterprise.” In the 1930s, between 5,000 and 10,000 rural Catholics (mostly lay people, with a few priests) attended the conference’s annual national conventions; in the 1940s, attendance hovered between 20,000 and 30,000. Like the Catholic Workers, the National Catholic Rural Life Conference continues its efforts today. In the nation’s industrialized cities, a similar organizing spirit found expression in the formation of the Association of Catholic Trade Unionists (ACTU). The name was an accurate description: It was not a Catholic union as such, but an association of individual Catholics who were union members. Its founder was John C. Cort, who had converted to Catholicism while an undergraduate at Harvard. In February 1937, he and a dozen friends from the Catholic Worker house on Mott Street in Manhattan resolved “to bring to Catholic workingmen and women a knowledge of the social teaching of the Catholic Church.” That spring, they threw their support behind striking saleswomen at Woolworth’s department store, and they garnered public attention by picketing the home of the socialite (and Woolworth heiress) Barbara Hutton. Defenders of Hutton pointed to the millions she gave to charity, but Cort and his companions fired back with a quotation from Pius XI: “Workers are not to receive as alms what is their due in justice.” By the 1940s, ACTU was running 150 labor schools in parishes around the country, every year graduating more than 5,000 men and women versed in such Catholic social texts as Rerum Novarum, Leo XIII’s 1891 endorsement of fair wages and collective bargaining, and determined to apply their principles to the cause of labor. The association gradually fell apart in the 1970s, the victim of dramatic declines in union membership nationwide. While it flourished, however, it mobilized lay Catholics in their working and religious lives. Proponents of Catholic Action were not so successful when it came to racial injustice. The number of African-Americans who were Catholic in the early 20th century was small, far outstripped by white European immigrants and their children. In 1920, blacks accounted for only about 200,000 in a Catholic population of 18 million, making them a “minority within a minority.” (Today, their representation among Catholics has tripled, to 3.3 percent.) Everywhere across the South, the legal segregation that applied to drinking fountains, hotels, and buses was carried over into parish churches and schools. Blacks sat apart at Sunday Mass and usually had to wait until white parishioners had received Communion before they could approach the altar. In the North, the de facto segregation of urban housing patterns achieved much the same effect. Boston, New York, Philadelphia, and a few other cities had distinct parishes for black Catholics, modeled on the “national” parishes of other ethnic groups, but their benefits were mixed. They provided black parishioners with churches of their own, but they also perpetuated separation of the races, which many Catholics were coming to see as inimical to the message of the gospels. In response, some Catholics, scattered across the country, formed groups to confront racial issues. In New York City, the Jesuit writer and editor John LaFarge, son of the painter of the same name, took the lead in establishing the Catholic Interracial Council (CIC) in 1934. Six hundred lay people, black and white, attended an organizational meeting in Town Hall that spring, vowing “to promote in every practicable way relations between the races based on Christian principles.” Subsequent biweekly meetings brought in a range of speakers, including representatives of the National Urban League and other civil rights organizations, but attracted far smaller numbers. The group’s membership was overwhelmingly white, and, ironically, its energy undercut earlier efforts on the part of black Catholics to organize on their own. Personal action rather than public protest marked the CIC approach and that of most other lay Catholic efforts, but such assemblies helped prepare Catholics for participation in the civil rights movement of the 1950s. The threat of Catholic boycotts was a powerful one, and sometimes it was backed by action. A theater in Sayville, Long Island, was showing Mae West’s 1934 film Belle of the Nineties, until a priest from the local parish showed up and stood outside, examining the faces of those who bought tickets to see if any of his parishioners were among them. Attendance dropped off immediately, and the manager closed the picture down. In 1935, the legion opened a national office in New York City and oversaw an elaborate system, run mostly by lay women, of rating films. One hundred volunteers from the Federation of Catholic Alumnae, an organization for graduates of Catholic women’s colleges, viewed newly released films and assessed their content, assigning letter grades from A (“morally unobjectionable”), through several grades of A-minus (“morally unobjectionable in part”), to C (“condemned”). The legion office trained them and monitored their work: One new volunteer was reprimanded when she rated as unobjectionable a movie in which a man divorced his wife to marry someone else. Diocesan newspapers published the ratings, and sometimes priests announced the grades of movies playing in local theaters from the pulpit on Sunday mornings. Some non-Catholics objected to this blunt exercise of Catholic power, but many Protestant churches praised the legion. The Federal Council of Churches, representing the nation’s mainline Protestant denominations, thanked Catholics for their “aggressive position” on the subject. In all, the legion, later renamed the National Catholic Office for Motion Pictures, rated more than 16,000 feature-length films. When it closed its doors in 1980, it issued one final list of seven condemned movies, including All That Jazz, Friday the 13th, American Gigolo, and Dressed to Kill. Today, the U.S. Conference of Catholic Bishops provides the Catholic press with reviews and ratings (from A-1, for general patronage, to O, for morally offensive), through its Office for Film and Broadcasting. The CFM was not for either men or women alone but for couples. This in itself was valuable, members said. One of its “happy by-products,” according to a CFM manual, was that, “because they are doing more things together, [couples] draw together in a deeper, more mature love.” Two couples in particular were responsible for the movement’s early success and rapid expansion: Pat and Patty Crowley of Chicago, and Burnett and Helene Bauer of South Bend, Indiana. Hearing of others who shared their interest, these four convened some 60 participants, together with a dozen priests, at a retreat house outside Chicago in June 1949 and established a national organization. The Crowleys were elected cochairs, a position they held until 1970. Annual conventions followed, and these grew to impressive proportions, though not without some missteps. One early meeting was held at a monastery: Apparently, no one had realized that men and women were not allowed to stay in the same room at this facility, thereby undercutting the closeness of husband and wife that the movement sought to promote. By 1955, more than 300 cities had at least one CFM cell. San Francisco and Denver had enrolled more than 500 couples each. (The group always counted its membership in couples.) Toledo boasted more than 300, Los Angeles about 250. Total membership nationwide stood at 16,000 couples that year; the count would double only two years later. Although the CFM always had priestly advisors, it was an organization of lay people. Chaplains were warned to speak as little as possible at cell meetings. The movement thus gave clear articulation to the ideal, common to all Catholic Action efforts, of direct lay participation in the work of the Church. “We seek first of all to have Christian principles dominate every phase of our personal living,” Catholic Action: A Textbook for Colleges and Study Clubs declared in 1935, “and then to bring those principles into all the ramifications of life about us.” Whenever couples in the Christian Family Movement, or volunteers in a Catholic Worker house, or trade unionists allied with fellow Catholics, or farmers reliant on the cooperative programs of the Catholic Rural Life Conference—whenever any of these people reaffirmed their involvement through attendance and participation, they were tightening the connection between their religious and secular lives. They became Catholic Action Catholics—Catholics not only in church but also on the picket line or in the field or cooking the family dinner. Studying Church teaching on their own, not just hearing about it in sermons, was their responsibility. Here was a more encompassing way of being a lay Catholic. Catholic Action participants did not overtly challenge this understanding. At the same time, the possibility was opened that lay people might sometimes take the lead. “Laymen are not second class members of the Body of Christ,” the CFM national newsletter said bluntly in 1957. The full implication of that outlook would become apparent in the 1960s and beyond, in the aftermath of the Second Vatican Council and its declaration that the Church should be understood as the “People of God.” A sense of autonomy would come to pervade American lay Catholics. The rhetoric and programs of Catholic Action helped prepare the way. 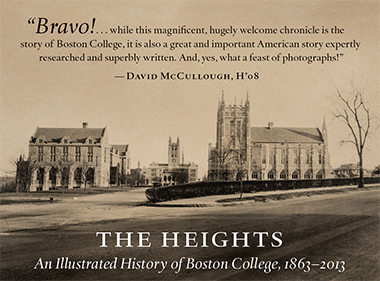 James M. O’Toole ’72, Ph.D.’87 is the Clough Millennium Professor of History at Boston College. His essay is drawn from his new book, The Faithful: A History of Catholics in America, copyright © 2008 by the President and Fellows of Harvard College, by permission of the Belknap Press of Harvard University Press.